Through the use of ConXMail, knowledge workers are empowered to work with Microsoft Outlook © as usual, but now have seamless access to the Corporate repository through the same user interface. The flexible, configurable integration framework allows an organisation to meet the ever changing and challenging requirements of their business ensuring appropriate information and business rules are applied when storing email messages and attachments into the repository, whilst also validating any metadata entered by the user. 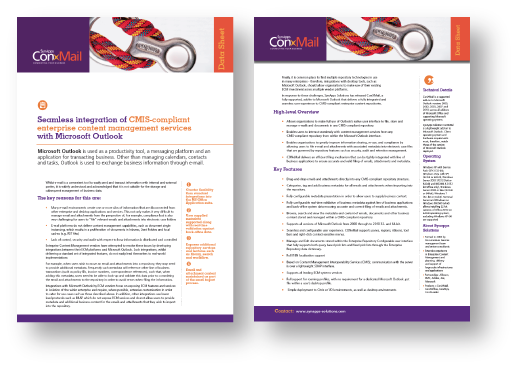 ConXMail enables custom metadata fields to be configured, populated and validated from external business systems as part of the import process into the Enterprise Repository; consequently enables key business information to benefit from the enterprise rules that are implemented across other areas of the organisation. 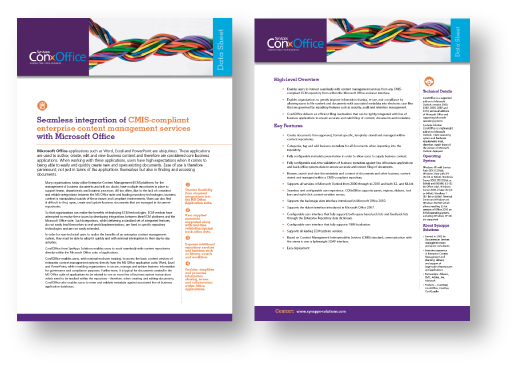 By integrating Enterprise Content Management features directly into the Microsoft Office © interfaces, ConXOffice empowers knowledge workers with full Create, Review, Update and Delete (CRUD) functionality that allows them complete control over relevant business documents using common applications which they use on a daily basis. ConXOffice provides users access to the underlying repository directly from within the desktop productivity tools such as Microsoft Word ©, Microsoft Excel ©, Microsoft Powerpoint © and line of business applications such as SAP and Oracle eBusiness etc. The flexible integration framework allows configuration to meet specific requirements of your business in areas such as the creation of documents from templates, validating any metadata entered by the user before saving into the Enterprise Repository.